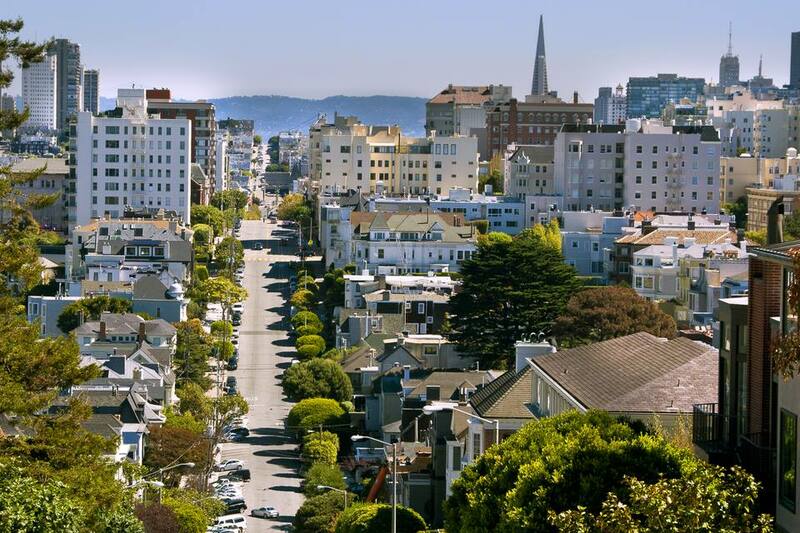 Perched a few hundred feet above sea level, San Francisco's magnificent Pacific Heights neighborhood is known for its multi-million dollar homes and sweeping views that extend all the way out to the Marin Headlands, across the Golden Gate Bridge. But there's also plenty of other things to see and do in “Pac Heights,” include dining at some of the city's top restaurants, catching a movie at a historic theater, and shopping options galore. The neighborhood's two parks — Lafayette Park and Alta Plaza Park — both served as refugee camps when the 1906 earthquake and fire destroyed much of San Francisco, and they've been safe havens since. Alta Plaza has a particular draw, with stunning views of San Francisco Bay, including Alcatraz, and downtown. Watch a game of pick-up basketball, play a round of tennis, or catch some afternoon sun of the southern facing terraced lawn of this 12-acre park. There's even an off-leash area for pooches and a playground for kids. The park's grand staircase has its own bit of lore: it was used, without permission, in a car chase scene from the 1972 film Barbra Streisand-Ryan O’Neal "What's Up, Doc?" The damage to the stairs is still visible. Pacific Heights became the de facto neighborhood for San Francisco's rich after the 1906 earthquake, when they realized it offers some of the best views in the city. Today it's where you'll find some of San Francisco's most spectacular homes: sprawling mansions with manicured lawns, ornate balconies, and gawkable exteriors. The residents are a mix of Old Money and current tech magnates — people like Oracle founder Larry Ellison and Yelp CEO Jeremy Stoppelman — though all the homes are equally impressive. SF City Guides offers walking tours of the area, which also includes the Spreckels Mansion, a 27-room French Baroque chateau built with sugar magnate money that occupies an entire city block. In a city where classic theaters are slowing going the way of the dodo, Pac Heights has managed to hold on to two of its cinema treasures. The Art Deco-style Clay Theatre on Fillmore Street was built in 1910 as a nickelodeon house and later became a venue for foreign movies, before expanding to screen more general feature and independent films. In 1972, Director John Waters' "Pink Flamingos" played here as San Francisco's first midnight movie, and today this Landmark theater is known for its midnight showings — films like "Rocky Horror" and cult classic, "The Room." The Vogue on Sacramento at Presidio Avenue is the neighborhood's other historic theatre, an independent space mixing classic and first-run cinema, and hosts the annual Mostly British Film Festival each February. Get ready to spend (or do some killer window-browsing) in Pacific Heights, a neighborhood known for its high-end designer shops and independent boutiques. Fillmore Street is Pac Heights' main shopping hub, a stretch of storefronts devoted to big names like Prada, Ralph Lauren and Marc by Marc Jacobs. There's also prime shopping along Sacramento Street, stretching into Presidio Heights with a more family-oriented (though still high-end) selection. Fashionable consignment shops are also the norm. Gourmet dining definitely has its place in Pacific Heights, one of the few neighborhoods in San Francisco where dressing up for dinner feels somewhat appropriate. Restaurants run the gamut from Fillmore Street's landmark Elite Café — a New Orleans-inspired eatery sporting classic mahogany booths and Art Deco stylings — to Out the Door, the casual off-shoot of SF's beloved Slanted Door, serving up Vietnamese street food (think Dungeness crab with cellophane noodles) in an industrial chic setting. Other favorites include the Michelin-starred Italian eatery, SPQR, cozy French-inspired bistro Curbside Café, and brunch hot-spot Ella's. From Neapolitan-inspired inspired pizza to innovative sushi offerings, you'll find plenty here to satisfy your appetite. If imbibing is your thing, Pac Heights has a surplus of worthwhile bars to get your drink on. Don't miss Harry's, a decades-old sports bar (and neighborhood institution) serving up American eats and cocktails in an elegant mahogany wood setting. The San Francisco Athletic Club is home to a couple dozen big-screen TVs and the “bathtub of beer,” an ice-filled porcelain tub holding two-dozen bottles of beer — delivered directly to your table. Trivia Tuesday and fried pickles also keep crowds coming. Tucked into the Laurel Inn on Presidio at California, the Laureate Bar & Lounge is brimming with Mid-Century Modern aesthetics and inventive cocktails, while the aptly named Snug occupies a remodeled two-story space, serves up cocktails infused with bee pollen and mixed with wheat grass, and features a bar made from salvaged Douglas Fir trees. Being a city of hills also makes San Francisco a city of staircases. The Lyon Street steps (at Lyon and Broadway) are one of the local favorites: a 332-step stretch from top to bottom, covering about two city blocks and connecting Pac Heights with San Francisco's Cow Hollow neighborhood and the Marina waterfront below. Views from the top are simply incredible. While many locals use the steps for their daily exercise, you may want to take it easy and enjoy the scenery as you go. Whether you're a TV and film buff or have a penchant for pop culture, Pacific Heights happens to be home to some of San Francisco's most famous on-screen locals. Grove High School, which Anne Hathaway's character Mia attends in the 2001 film "The Princess Diaries," is a residential mansion at 2601 Lyon Street. The "Mrs. Doubtfire" house is at 2640 Steiner Street at Broadway, and the towering Victorian from '90s TV show "Party of Five" is at 2311 Broadway. Pac Heights is even the site of the Tanner's "Full House" home, tucked away on the neighborhood's southwest side at 1709 Broderick Street. Surprisingly, the 1990 thriller "Pacific Heights" — named for the neighborhood — was actually filmed in San Francisco's Potrero Hill. Built in 1886, San Francisco's Haas-Lilienthal House is San Francisco's only Victorian home open regularly to visitors as a museum. This Queen Anne-style beauty — complete with peaked roofs and a turret — has been welcoming guests since 1973, when the family of the home's original owners turned it over to San Francisco Heritage. The house is filled with authentic furniture and artifacts from the Gilded Age, and tours cover everything from the basement ballroom to the second floor sleeping quarters.